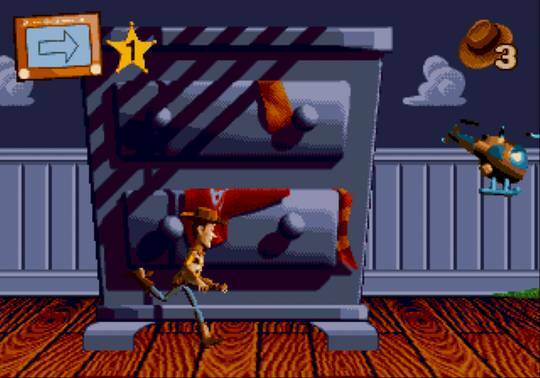 Toy Story is an action-platformer that's based on the 1995 movie of the same name. Playing as Woody, your mission is to rescue Buzz Lightyear and restore peace to your owner's world of toys. To do this, you'll need to navigate through 18 levels while using Woody's pull-string to stun enemies. The gameplay prefers to use a mission structure rather than a typical 'navigate from A to B' approach; while this could frustrate those who like to skip cut-scenes and just focus on moving from left-to-right, it's vital that you take time to read the mission briefs. If you do, each level is fun and includes a ton of variety to keep things interesting, such as needing to get all the toys into their homes before your owner walks in. The platforming is enjoyable with responsive controls and solid level design, although a minor quibble is that the screen doesn't always scroll far enough. The gameplay never rests on its laurels and instead includes 3D / top-down RC car driving stages, auto-scrolling chase sequences, and even areas where you control a soft drink trying to enter a pizza parlour! Other titles such as The Adventures of Bayou Billy (1989, NES) tried this mishmash approach with poor results, but on the whole, everything here works pretty well. The first-person sections where you need to collect aliens really shows off the power of the Mega Drive thanks to its smooth frame-rate, and I'd love to see an FPS using this engine! The RC car stages are a little too sensitive to control, but at least there's a generous time limit to help you take things slower. Graphically, the game is outstanding thanks to its large sprites and fluid animation, and there's even some excellent sounding voice samples. Toy Story is a wildly ambitious title and while it does falter in a few areas it really does deserve huge credit for pushing the humble Mega Drive to its absolute brink. The sheer variety is astonishing and ensures that you'll never get bored, even with repeated play-throughs. Random trivia: The game was also released on the Nintendo Game Boy, Super Nintendo and Windows PC.